Each year, over 1,000 runners hit Montclair Road in Birmingham on Thanksgiving morning to take part in the Sam Lapidus Montclair Run. This year, the run is expanding so runners of all levels can participate. In addition to the usual 10-kilometer race and one-mile fun run, the Levite Jewish Community Center’s 39th annual event will also feature a 5-kilometer race, sponsored by Schaeffer Eye Center. The event was renamed in 2008 in memory of Sam Lapidus, who loved fitness and working out at the LJCC. He was diagnosed with Ewing’s sarcoma at age 9 in 2003, but refused to let it alter his plans. He died in November 2008, just shy of his 15th birthday, and Bruce Sokol urged the LJCC to name the event in his memory. 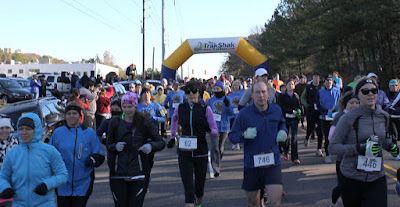 Proceeds from the race benefit the Alabama Center for Childhood Cancer and Blood Disorders at Children’s of Alabama and the LJCC Fitness Program. The Center for Childhood Cancer donations help children in Alabama by enhancing services, building new programs, and recruiting new physicians and researchers. Registration is already open online and at the LJCC. Packet pickup and registration starts on Nov. 25 at 9 a.m., then at 7 a.m. on Nov. 26. The 10- and 5-kilometer races will begin at 8:30 a.m., at which point registration will begin for the fun run. The fun run will be at 10 a.m., and an awards ceremony will begin around 10:30 a.m. There will be RFID chip timing and awards to the top three overall finishers and by age group in male and female categories. All entrants will receive a T-shirt, and the course is certified by USATF.